Is your water bill higher than expected? If so, you may have a water leak. Finding a water leak is not always easy. Water leaks are not always visible. It is easy to spot a faucet that leaks, but what about a pipe that leaks? This can be harder to detect. Pipes can leak anywhere. They can leak under the cabinet, in the wall, and in the ground. A leak in the ground and wall are the hardest to detect. Thus, we recommend a water leak detection in Queen Creek, AZ. 4fathers Plumbing offers a water leak detection service for home owners. Once the leak is found, 4fathers Plumbing will give an estimate on how much fixing the leak will cost. If it is a simple matter that does not require going into walls, the leak can be fixed promptly. Do not wait until a tiny water leak becomes a bigger problem. You can stop the leaking in your pipes and in your wallet with one call to 4fathers Plumbing and Home Services. These professionals are not limited to water leak detection only. 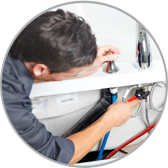 They do installations and repairs for all your plumbing fixtures. They undertake a vast range of plumbing jobs, including unblocking of sinks, toilets, and any drain, repairing toilet flushes, resealing of baths, basins, and showers, fitting and repairing taps, curing leaks, replacing cracked tiles and connecting dishwashers and washing machines. A single visit by handyman to do a water leak detection in Queen Creek, AZ can easily turn into a large home repair, as our employees are skilled in most areas. Should this happen, the company will schedule how the repairs will be done because some take a longer time to complete than others.